The company provides complete technical know-how and guidance in the installation of the Pearl Farming project and offers the "BUY BACK GUARANTEE". Pearl is a natural gem which is produced in oysters. There is an increased demand for pearls every where including India, but due to exploitation and pollution, it is decreasing in numbers. To fulfill the domestic demand, India is importing pearls in heavy quantity from the international market every year. The technique to make fresh pearls from oysters of fresh water has developed which are found in a large quantity all over the country. A pearl is produced in a natural way when a foreign body like a sand particle or an insect enters in the oyster and the oyster cannot throw it out but covers it with shining layers. This easy method is used for pearl manufacturing. This calcium carbonate is made of organic bodies and water. The pearls available in the market can be artificial, natural or made up. The artificial pearl is not a real pearl but a product similar to it, which is round in shape and has a shiny outer layer like a pearl. The center of a natural pearl is vey micro but the outer layer is thick. It is small in size and irregular in shape. Produced pearl is also similar to a natural pearl, the only difference being that the human efforts are added to it to get size, shapes and color as per choice. Normally in India, three breeds of oysters are found: - laymilidens marginalia, 1. koreanas and pairshia korugata from which good quality pearls can be produced. In our Indian rivers mostly we find oysters named parishia korugata. The oysters we need to produce pearls should be 10 to 12 cms in length and 50 gms in weight. In the chemical disintegration of a pearl, we find 82 to 86% calcium carbonate, 10 to 14% conical and 2 to 4% water. Manmade pearl is produced by Tissue transplant of mantle cavity. Cavity : Pearl is produced by inserting a foreign body inside the oyster. These are used in making rings and lockets. Because of its shining, a single pearl costs in thousands. Gonut : In this a naturally round pearl is produced. This pearl is shiny and beautiful. The cost of each pearl according to its shine and shape is between 1 to 50,000 rupees. Mantletissue : In this a part of the oyster's body itself is inserted inside the oyster. This pearl is used in making edible products like pearl powder, chyavanprash and tonic. There is a maximum demand for these pearls in the market. 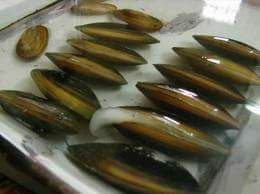 Rearing of implanted shells in the lake. Collecting the pearls and shell's produce. How is pearl farming done? Pearl fanning needs a lake of minimum 10 x10 feet or a bigger sized lake. To start pearl fanning the farmer needs to collect the clamshells first. After that a small operation is done upon which designer moulds like that of a Ganpati, Buddha or flowers etc of 4 to 6 millimeter diameter is inserted in each clamshell. Then the shell is closed. These shells are kept in nylon bags for 10 days nurturing with natural fodder and antibiotics. They are checked daily and dead shells are removed. Then the shells are put into the lake. For this they are kept in nylon bags (two shells per bag) and hung in the lake with the help of a bamboo stick or PVC pipe and let loose in the lake at the depth of 1 meter. The sticky secretion deposits around the nucleus and in the end take the shape of a pearl. The designer slits open the shell and takes away the pearl after about 8 10 months. Their outer cover and muscles become loose. Shells should not be kept out of water for long. After the muscles loosen, a small granule of sand is inserted inside the shell through a hole, 2 to 3 mm in size, made on the surface of the shells. After the operation the clamshells are kept in a post operative tank for 10 days with some medicines. After 10 days these clamshells are taken out and kept in the main tank and checked every 5-6 days. To maintain the oxygen level of the water in the tank, it has to be rotated. For these 10 days the clamshells are checked every day. When the sand granule irritates the sell, it starts secreting the sticky matter. The shells are kept in nylon bags (2-3 per bag) and hung in the lake with the help of a bamboo stick or PVC pipe. After 15 to 20 months the pearl gets ready and you can take them out by breaking the cover. The designer pearl gets ready in one year and the round pearl gets ready in 2 years. First of all you need a training from expert scientists which is provided through our company. After the training you will have to buy the clamshells from our company. Clamshells are let loose in free water for two days. The method is decided according to the spot of the surgery 1. Center of the surface. 2. Cell of the surface and 3. Surgery of the reproductive organs. The main things used in this are the nucleus and mould, which are made from the shell covers or materials with calcium. Surgery of the center of the surface: In this process, designer moulds of 3 to 6 mm diameter with the shape of Ganesh, Buddha or flowers etc are inserted after separating the two covers of the shell. The covers are separated with the help of surgical instruments. Efforts are made to keep the designed side is towards the surface. After placing the mould thus the shell is closed leaving some space. Surgery of the surface cell: here the shell is divided in two categories donor and the receiver. In this process, the first step is to prepare a graft (small parts of the cell). For this a strip is made from the borders of the shell which is for the donor. This is cut in two small parts of 2/2 mm for the receiver of the designer mould. This is of two types, nucleus and non nucleus. In the non nucleus type only the cut parts or the grafts are inserted while in the other type one part of graft and a small nucleus of 2 mm is also inserted. Care is taken that the nucleus or the graft does not come out. Surgery of the reproductive organs; in this also a proper process of making grafts is applied. First of a cut is made on the border of the clamshell's reproductive area. After that one nucleus and a graft are so inserted that they cling to each other. Care is taken that the nucleus touches the outer part of the graft and during the surgery need to cut the intestine does not occur. If you are interested in doing business with minimum investment and get good profit, then this news is useful for you. You can achieve your this financial goal by doing pearl farming. By investing just 2 lakh rupees you can earn about Rs. 20 lakh in a year. Start with investing Rs. 20,000: One clamshell costs about Rs.20 to 30. The cost of pearls from 1 mm to 20mm is about Rs.300 to Rs.1, 500 in the market. Nowadays the designer pearls have a good demand for which you can get good returns. Compared to Indian market you can earn well by exporting pearls to foreign markets. Also you can sell the shells after getting the pearls out of it. These shells are used as decorative material. You can start pearl manufacturing by rearing 100 clamshells. Each clamshell costs about Rs. 15 to 25. For this the expenses on structure set up will be about 10 to 12,000 rupees, 1,000 rupees for water treatment and 1,000 rupees to buy instruments. Calculating thus, if your pearls are of good quality, you can earn about 1 lakh rupees within 15 to 20 months. Earnings can be in lakhs. After 15 to 20 months, one pearl gets ready in one clamshell for which the price you can get in the market is from 300 to 1500 rupees. For good quality and designer pearls you can get much more prices estimated to about 10000 rupees in the international market. You can increase the number of clamshells as per your resources. For example, if you rear 2000 clamshells, the expenses will be nearly 2 lakh rupees. Pearls are generally round, but through farming you can rear designer pearls which are costly. Moulds of different shapes (Ganesh, Christ, Cross, flowers etc) are inserted in the shells. After the whole process the pearls take the same shape. 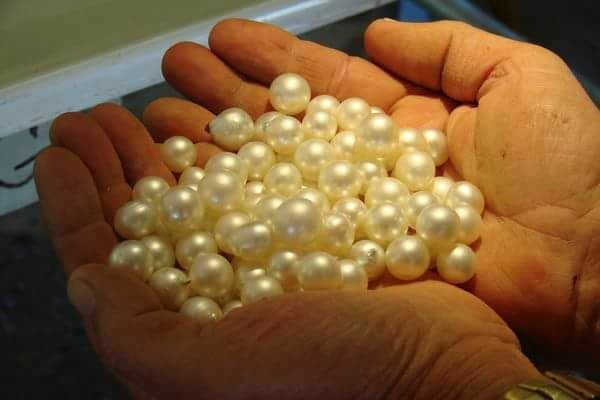 There is a great demand for such pearls in our country and in foreign countries and they sell at much higher prices than the common pearls.Calculating thus, if your pearls are of good quality, you can earn about 1 lakh rupees within 15 to 20 months. If the quality is good, a single pearl can be sold from 300 to 15,000 rupees. It is very important to sell the produce after fanning. But it is not so with pearls. Thousands of merchants deal in pearls in cities like Hyderabad, Surat, Ahmedabad and Mumbai. Agents of big companies are spread across the country and come in contact with pearl manufacturers. Apart from this, you can sell your pearls through internet or other such media. There is an increased demand for pearls everywhere including India, but due to exploitation and pollution, its production is decreasing. To fulfill the domestic demand, India is importing pearls in heavy quantity from the international market every year. My motherland emits gold and pearls. Truly our country has a long sea coastal line and many perennial rivers and lakes. Apart from fishing, our unemployed youth and farmers can earn good profit now by rearing pearls. The fanners bearing the disasters because of draught and bad monsoon as well as the jobless students should come forward in the field of pearl rearing because the demand of pearls in and out of the country the future of pearl farming seems bright. Many youth from different states have accepted pearl farming as a profession. Deducting the mortality rate to about 20%, the pearls produced in the clamshells are saleable. Designer pearls get ready in a year while round pearls take 2 years to get ready. 2 designer pearls are obtained from one clamshell. The price of each is Rs.100. One round pearl is obtained from one clamshell, the price ranging from Rs. 300 to Rs. 1500. If maintained longer, more weight in carats can be obtained. The formula to decide the number of clamshells suitable to your space is as follows: length + breadth + depth x 3 = number of clamshells. You need to appoint an operator for operation (surgery). The company will help to train the operator. The company provides the surgery set for the operation of the shells, the price of which is Rs. 1200. The designer dye can be obtained from the company the price of which is Rs. 1,000. Designer dye and round nucleus will be provided by the company as per the placed order. One caretaker is necessary to be appointed for the maintenance of the lake. 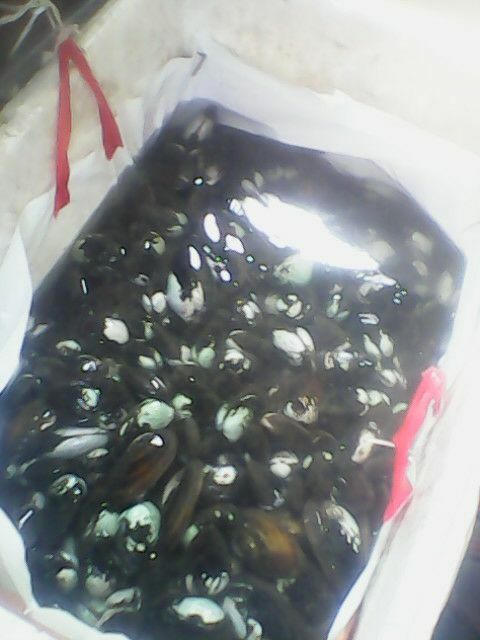 Complete responsibility for the fish rearing done along with pearl farming will be of the company. Inserting seeds, maintenance, buying fish, buyback will be done as per the market rate at the given time.